"Easy to understand course - incredibly helpful"
"The way you explain and illustrate things is wonderfully clear"
"I KNOW she wouldn’t have achieved such a great score without your fabulous system!" 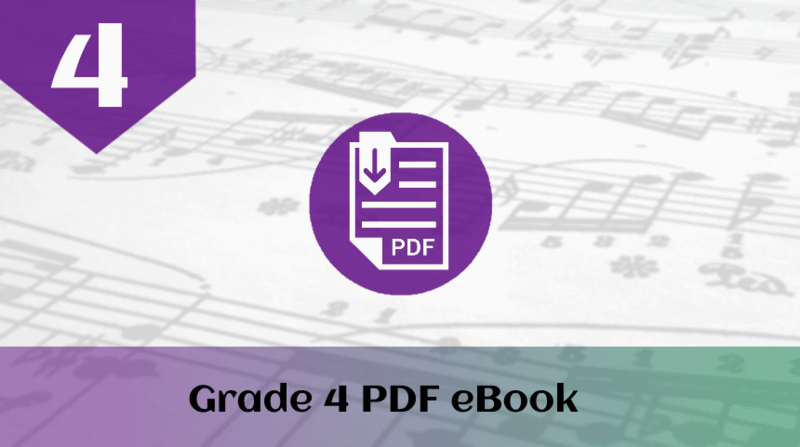 This is a comprehensive grade 4 music theory course following the ABRSM's syllabus. Each chapter provides a step-by-step explanation of the theory, with lots of musical examples. Each chapter is followed by a series of practice exercises. All answers are provided, with the exception of the composition question, due to its subjective nature. Suitable for home-study, or for use with your music teacher (age 10-adult). "My daughter needed Grade 5 Theory to get into her favourite uni but didn't even have grade 1. She worked her way up through all the available material from the start. She aced it with 99% and has received unconditionals to her top uni choices!"